We’re excited to announce that GlassWire 2.0 is now available for download. This major update is a free upgrade for 1.0 paid users, and for free users GlassWire now includes a fully unlocked free 7 day trial! What’s new with GlassWire 2.0? Earlier this year you may have received a survey request from us asking what you wanted from GlassWire. We went through your survey and tried to implement as many as your requests as possible, and we hope we’ve accomplished that with GlassWire 2.0. High DPI Support – One of the top requests from users was support for high resolution DPI monitors, and GlassWire now fully supports high resolution monitors. You can now change your monitor resolution and GlassWire itself will change sizes to support those resolutions. GlassWire also now has excellent dual monitor support so you can drag it between multiple monitors if you choose to do so. Data Usage Improvements – After launching our popular Android data usage app, we found a lot of our Windows users were unhappy with how GlassWire’s usage window worked. We changed GlassWire 2.0’s usage window to better match our Android app. Now it’s much easier to keep track of how much data your PC is using every month. Also, if you want to track your data usage in detail go to GlassWire’s top left GlassWire menu and choose “settings” to set up a Data Alert. 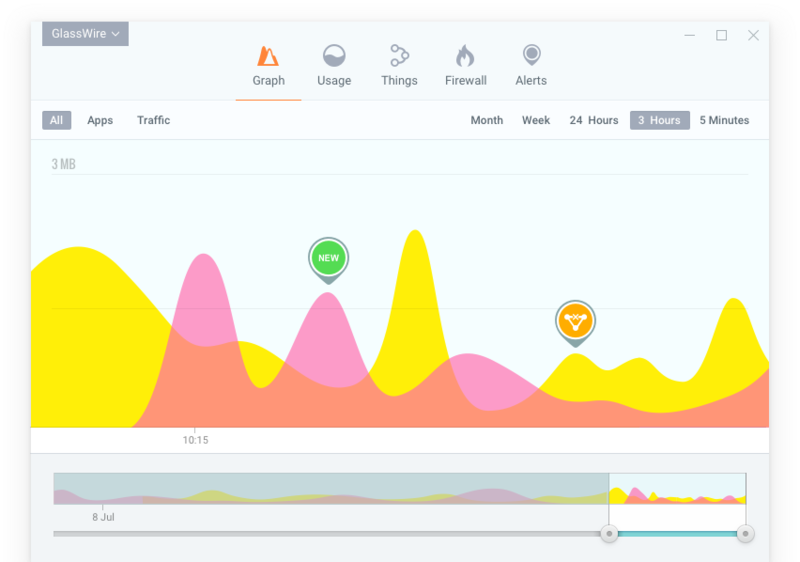 GlassWire’s Data Alerts can warn you before you go over a data usage limit. Firewall Profiles – Another request we saw was a wish for firewall profiles. Now you can go to GlassWire’s Firewall tab and click the top middle “Firewall Profiles” down arrow. You can now create a new firewall profile and save it. For example if you’d like an “Ask to connect” profile for public WiFi you can now set it up and save it and switch to it when you’re not at home or work. 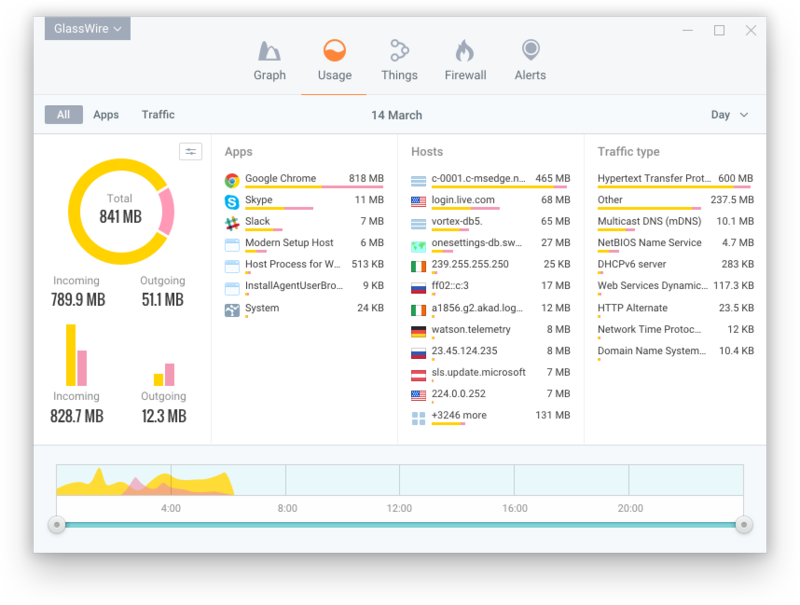 Firewall Improvements – Many people commented on how GlassWire’s Firewall worked, and how they wanted better compatibility with the Windows Firewall. With GlassWire 2.0 we have made our firewall rules sync with Windows firewall, plus GlassWire can check your Windows Firewall and restore it if changes are made without your knowledge. Security Analysis – Another top request was that people wanted to know more details about the apps that were accessing the network on their PC. You can now go to GlassWire’s settings to turn on the VirusTotal API to analyze network-related files on your PC. Do you have an Evil Twin lurking about? – A new type of network attack is known as an “Evil Twin” attack. This type of attack occurs when someone sets up a new WiFi access point with a name similar to your current WiFi access point. GlassWire watches out for these types of attacks by warning you if the Mac address of the WiFi access point you’re on changes. Of course if you’re using something like a mesh network with repeaters you may get occasional alerts, but as GlassWire learns these new access points over time the false alerts should stop. Also, if the WiFi access point you’re on loses its password you’ll also be alerted. A 7 day trial – A lot of our free users asked to have a GlassWire trial of our paid features, so we have enabled a 7 day trial that starts on installation of GlassWire. After the trial ends GlassWire’s security features and blocking reverts to its free status (similar to GlassWire 1.0’s free version). Ready to upgrade to GlassWire 2.0? Give it a try now! Having technical problems? Check out these tips in the forum. Are we still missing some features you’re wanting? Now that GlassWire supports high DPI we can move faster and add more features. We’re going through your list of requests in the survey we sent and we’re implementing them as quickly as possible. Want more features? Let us know what you want in the comments below! Thank you for your support and we hope you enjoy GlassWire 2.0! Great work, loving the update. I only wish that you could add more options for allow/denial of new connections. Is it possible to monitor my Android device with the Windows version and vice versa? Danke from Berlin! Looking forward to Linux support plese. Would rather have a Mac version. The best firewall I’ve come across for Mac is Little Snitch by Objective Development. I’ve been using it for 6-7 years now, and it’s phenomenal. I wish there was something that was the same for Windows. After being strictly a Mac user for the last several years, I’m surprised there isn’t anything on the level of Little Snitch for Windows yet. I’m banking on Glasswire stepping up to the plate to fulfillmy firewall needs for Windows.